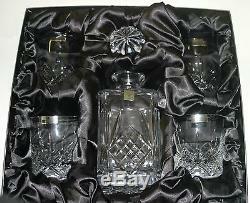 Caledonian 5 Piece Cut Lead Crystal Whisky Set. 1 Square Decanter (255mm Tall including stopper x 96mm Square). F Whisky Glasses (93mm Tall x 82mm Diameter). Supplied in beautiful black silk lined presentation box with laminated lid with the Caledonian crest. Ideal Gift for a Gentleman at Christmas or Corporate Gift. Check out my other items. 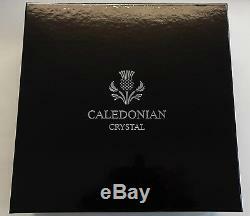 The item "Caledonian 5 Piece Cut Lead Crystal Whisky Set In Presentation Box" is in sale since Monday, March 4, 2013. This item is in the category "Pottery, Porcelain & Glass\Glass\Crystal/ Cut Glass\Crystal/ Cut Glass Objects\Decanters & Jugs". The seller is "cgbdiscountcentre" and is located in Wolverhampton, West Midlands. This item can be shipped to United Kingdom, Antigua and barbuda, Austria, Belgium, Bulgaria, Croatia, Cyprus, Czech republic, Denmark, Finland, France, Germany, Greece, Hungary, Ireland, Italy, Lithuania, Luxembourg, Malta, Netherlands, Poland, Portugal, Romania, Slovakia, Slovenia, Spain, Sweden, Australia, United States, Canada, Japan, New Zealand, China, Israel, Hong Kong, Norway, Indonesia, Malaysia, Mexico, Singapore, South Korea, Switzerland, Taiwan, Thailand, Bangladesh, Belize, Bermuda, Bolivia, Barbados, Brunei darussalam, Cayman islands, Dominica, Ecuador, Egypt, Guernsey, Gibraltar, Guadeloupe, Grenada, French guiana, Iceland, Jersey, Jordan, Cambodia, Saint kitts and nevis, Saint lucia, Liechtenstein, Sri lanka, Macao, Monaco, Maldives, Montserrat, Martinique, Nicaragua, Oman, Pakistan, Peru, Paraguay, Reunion, Turks and caicos islands, Aruba, Saudi arabia, South africa, United arab emirates, Ukraine, Estonia, Latvia, Brazil, Chile.